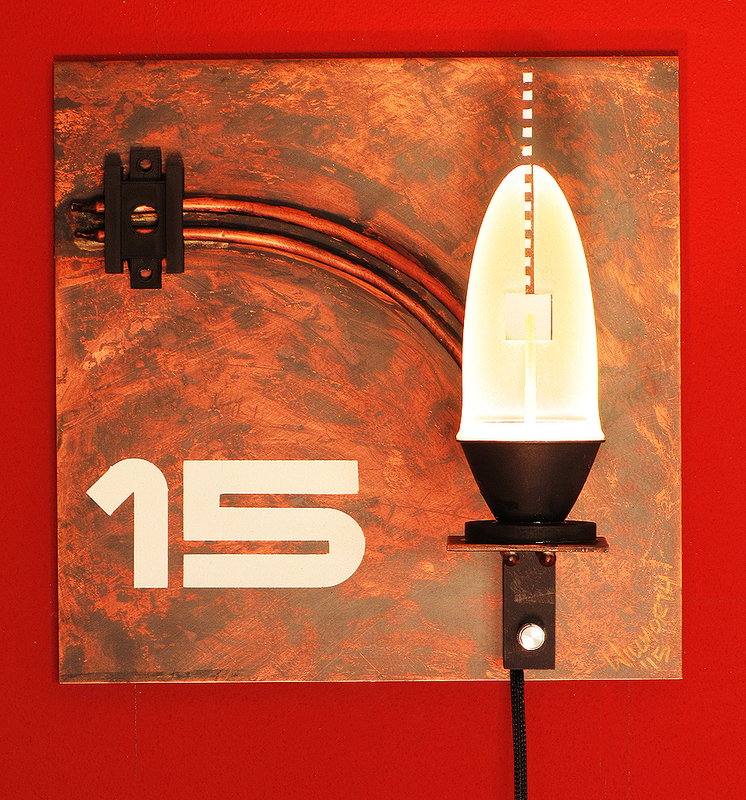 A little industrial chique tribute to 2015 Year of Light. Actually, this started as a rough lab test experiment applying thermal transfer pipes (copper pipes filled with water) to move heat from an LED platform to a simple back plane surface. The experiment included bending the pipes, soldering them using silver bearing solder, and operating the system at various angles to see the effect these had on performance. 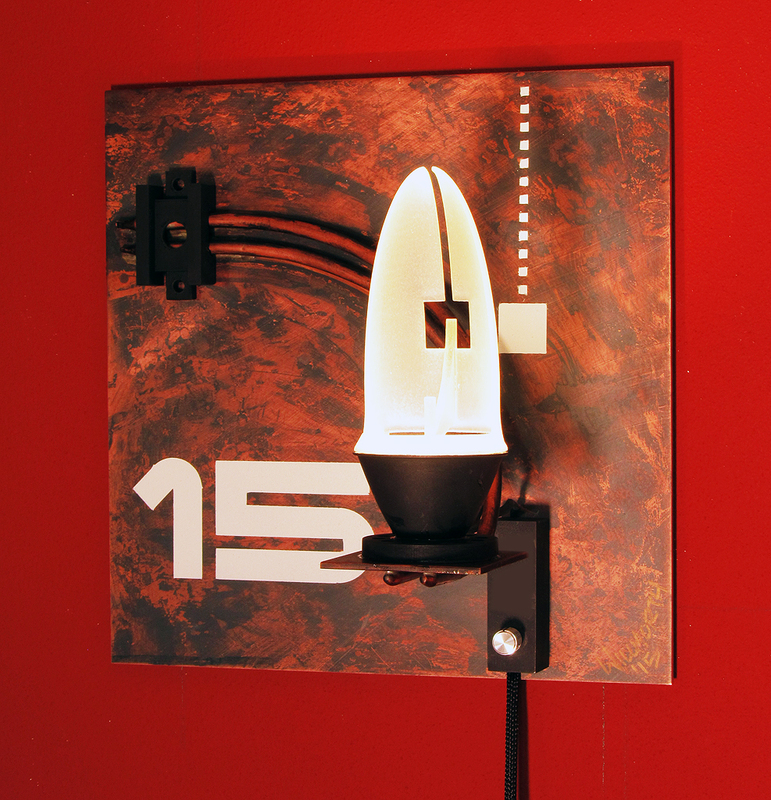 Somewhere along the line, an idea formed of making this into a wall piece, creating an industrial-chic, which led to adding a cut down reflector, and using the SLA printer to create an industrial tech representation of a flame rising from the reflector. 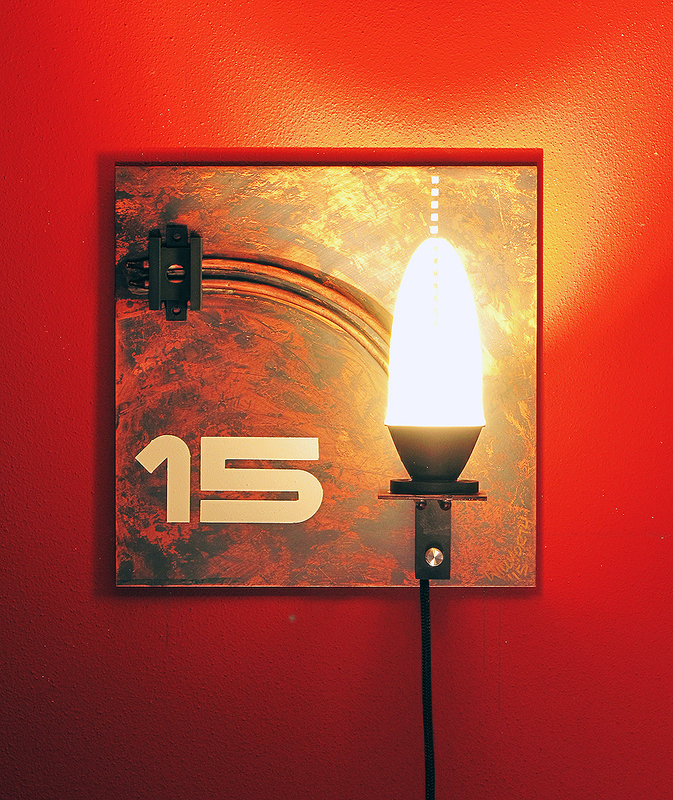 The square cut in the diffuser aligns with the connected graphic on the back plane, and the stenciled number 15 simply represents the year. The graphic alignment with the diffuser negative space connects the back-plane to the foremost diffuser component. 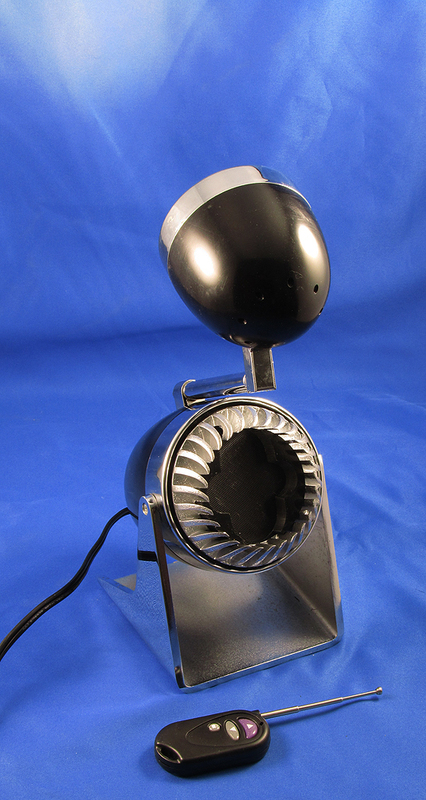 The driver is housed in the FDM printed housing below the light source on the back plane, with a dimmer. Total power to the source is 19W, while the LED is 95CRI 3000K. Note that the overly red hue to the background, and slight magenta appearance of the white graphics are all issues with the camera dealing with the red-enhanced LED source, which creates high CRI, with a 90 R9 value, but in reality is a distortion of spectral power that the human eye does not readily see – but mid-range camera image sensor algorithms cannot accommodate. The diffuser is intended to interpret a flame, or gas light sock. The thermal pipes move 19W of energy from the LED platform to the back-plane – which is where the whole project started. 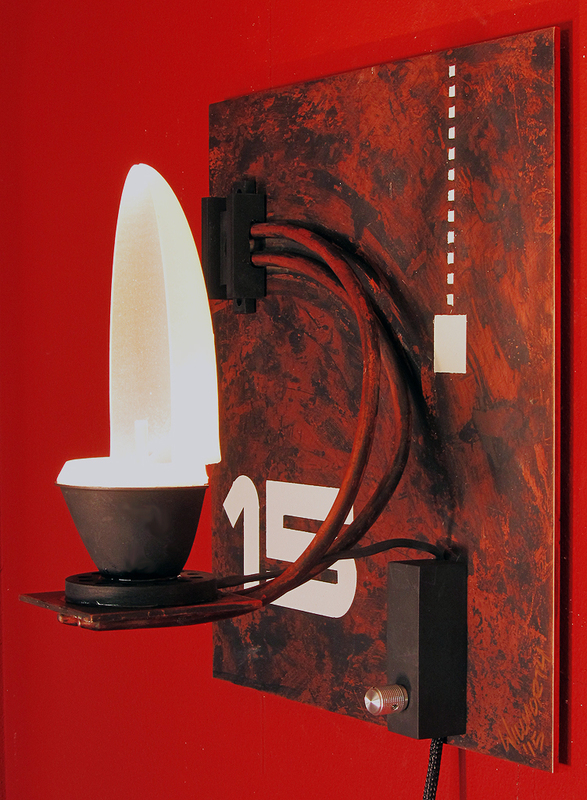 Cutting the back half of the reflector out provides light to the wall and plate surface. With the thawing of the midwest ice age, comes days on the bike once again. 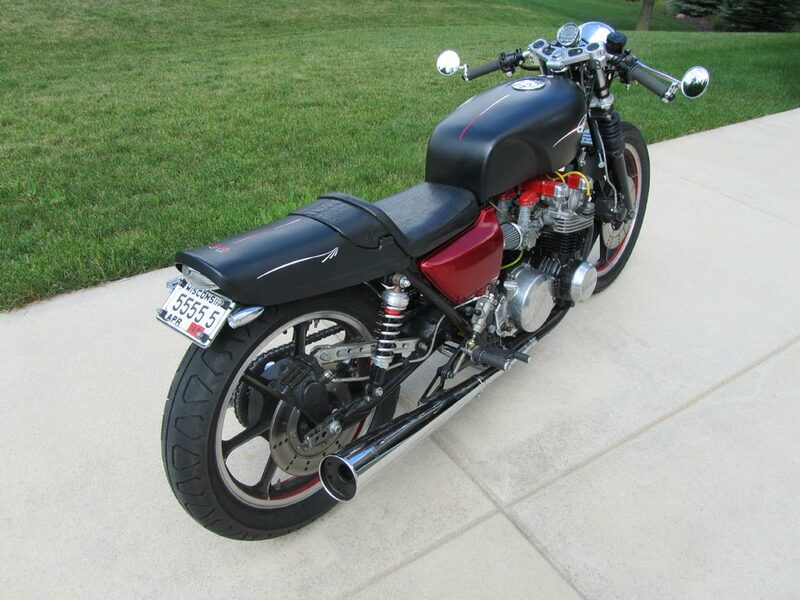 With the arrival of spring, I am once again longing for a rip on the open road and a little wind in the face with the rap of a high strung 4 banger UJM hot rod under me. But, let’s apply a little context as it relates to this years 52/52 project. While the previous works pursued in 2010 were focused on off-the-cuff works, with the majority being task lights, this year I am not remaining within those narrower bounds. For 2015, I’m going to present application of LEDs and SSL technology wherever I find a place for it, in actual applications, including, but not limited to lighting applications. There is a simple reason for this. My interest and pursuit of solid-state lighting integration is not bound to architectural lighting, it also includes UV curing and artistic application and, in this case, recreational uses. This overview shows all of the solid-state updates that have been applied to the project. 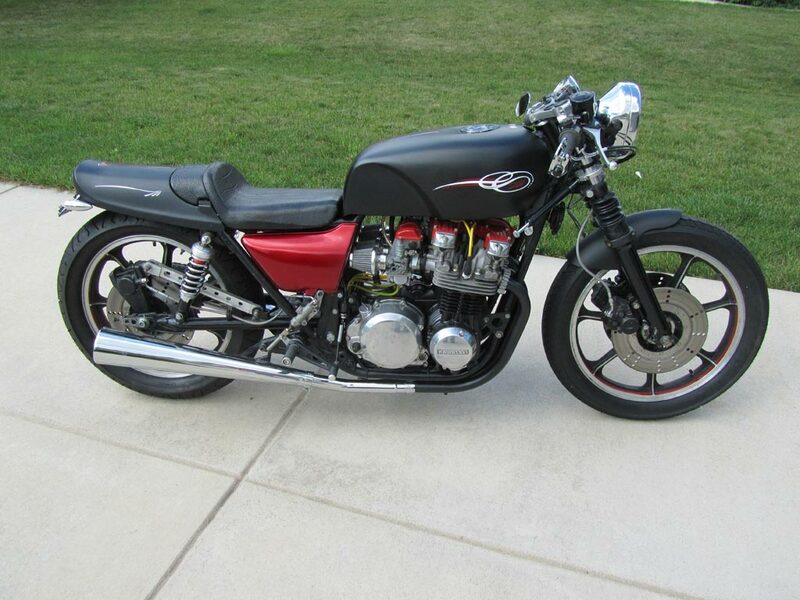 Note also that the rest of the bike has been heavily cut, re-made, modified, stretched, slammed, etc…. Not much remains of the original, although its original spirit remains visible. 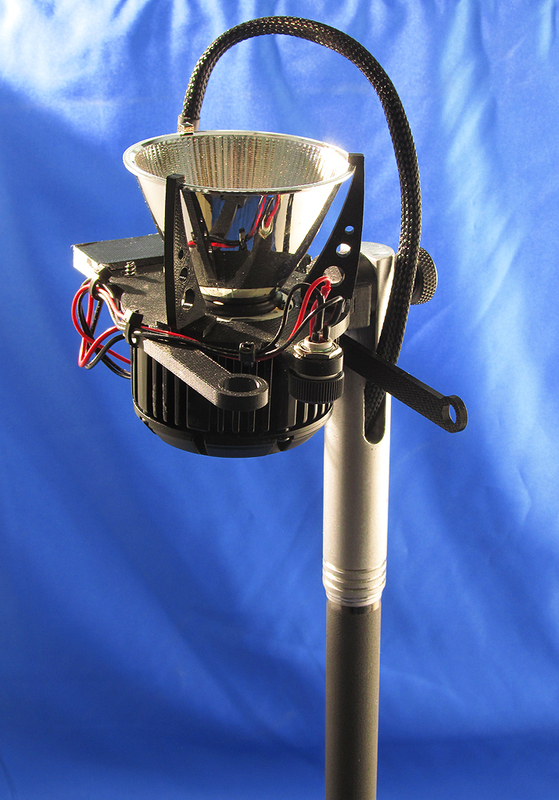 The LED lamp kit, with its heat sink and fan is a clever solution and just fits in the headlight housing. Compounding the issue of effective forward lighting, motorcycles, especially older ones like the one I am working on (1979), have fairly wimpy electrical charging systems, so voltage delivered to headlights tends to sag, delivering less light and warmer CCT’s. It seemed a perfect fit for application of LEDs operated from a current control driver, as this could eliminate the output droop from voltage drop, as well as increase the CCT of the light output to optimize visual performance and presence on the road. Unfortunately. sifting through the myriad of garbage being sold as LED H4 lamp replacements took some time, and included evaluation of several alternatives, many deemed useless scams. I discovered that without some form of cooling system, the LED bulbs either were not delivering enough light, or were operating at such a high temperature, they were likely to fry themselves and fail in less time than the halogen lamp I sought to rid myself of. 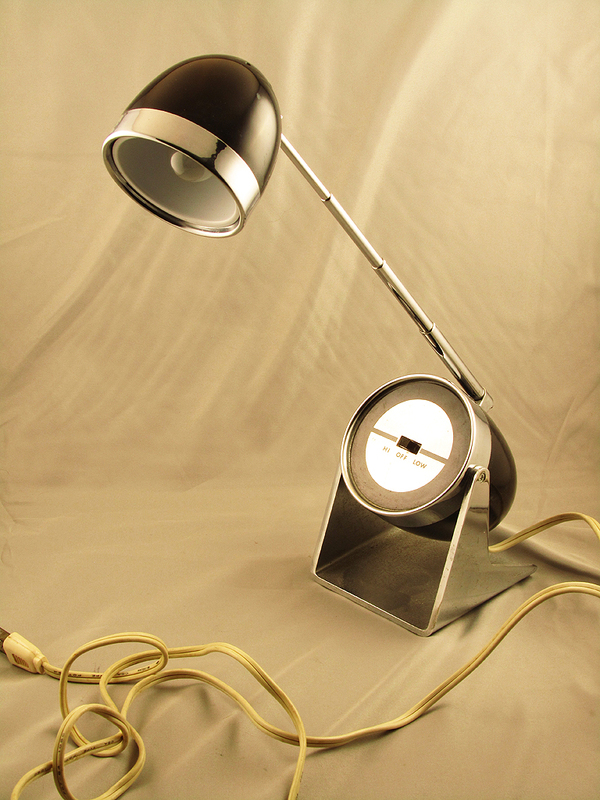 However, over the course of this winter, several new lamps came into the market that are looked promising. While not yet perfect, I found one that not only fit well, but delivered more light than the original halogen lamp. I was finally able to finish the LED conversion project this week, ending a two-year effort at last. The new system presents a load of 12W or 14W, replacing the 55/60W H4 Halogen lamp, while measured light output is increased by 15% (at full battery voltage, significantly more when the battery voltage is lower). 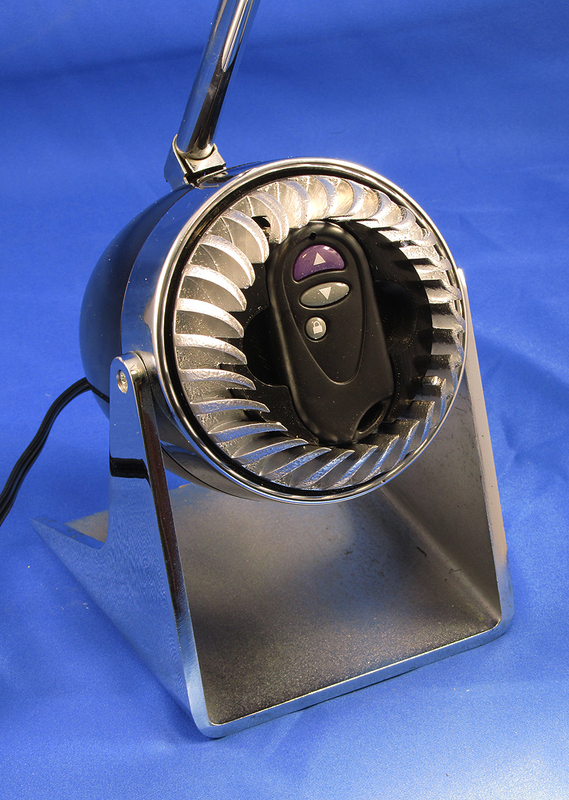 The lamp includes an active heat sink and fan to keep it cool, which I found in bench testing worked surprisingly well. In fact, the thermal slug-to-heat sink is very similar to a design I have used in several product designs with similar optical demands. Not really wild about the fan, so will keep an eye on that, but its necessary to produce the output and longevity I was looking for. The headlamp incorporates LEDs for turn indicators as well, within the lamp itself. In addition to forward , the headlamp integrates the turn signals. 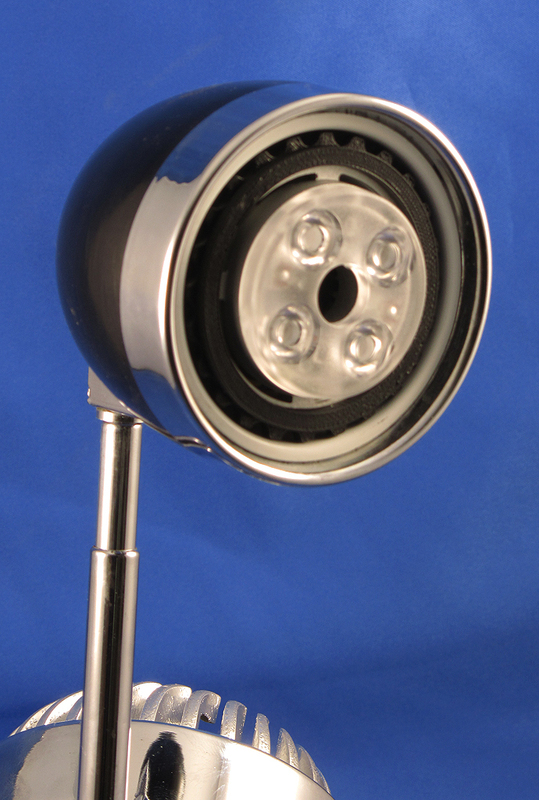 At the right and left side are amber LEDs embedded into the lamp reflector, which serve as turn signals and emergency flashers. 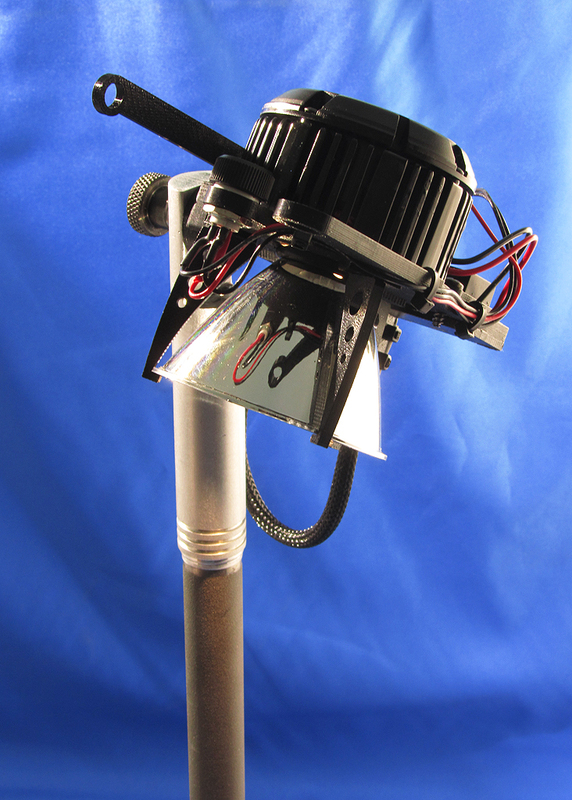 At the center is the H4 LED conversion lamp, which incorporates a current driver, cooling fan, and controller circuiting that maintains full light output, even when battery/system voltage drops to as low as 9.8V. The tail-light includes red LEDs and a controller that and white LEDs with a clever resister/bypass circuiting that lights all of the LEDs at a lower intensity for standard tail-light function, then brighter when the brake light is active. The rear turn signals are a Frankenstein creation of mine that includes custom interior bits to integrate proper Amber LEDs into the bullet shaped housing originally designed for a small incandescent lamp – I was unable to find any off-market products that had the brightness I wanted. The tail light and rear turn signals tuck in nicely with the rear of the bike – looking like it was all supposed to be where it is. The turn signal conversion to LEDs created an issue with the flasher system. Flashers in older vehicles are nothing more than a thermal cutoff switch that auto re-sets. When on, an internal leaf or coil heats up, breaking the circuit (off state), which then cools quickly and re-connects (on state). These are “tuned” to operate with a closed circuit, which an incandescent lamp provides. The load of the lamps in the circuit creates a resistance, which the flasher is tuned to, creating a flash rate based on how much voltage is present in the system based on how many incandescent lamps (acting like resistors) are in the circuit. This is why the flashers blink faster when a lamp is lost – increasing the voltage in the flasher “heater”, causing it to heat faster, thus, blink at a faster rate. Well… LEDs do not create a closed circuit for this process to work with. This requires either placing a resister into the system to create a closed circuit load similar to the original incandescent lamps (seems kind of silly), or replacing the flasher itself with some other modulating device that can blink without the closed circuit connection. 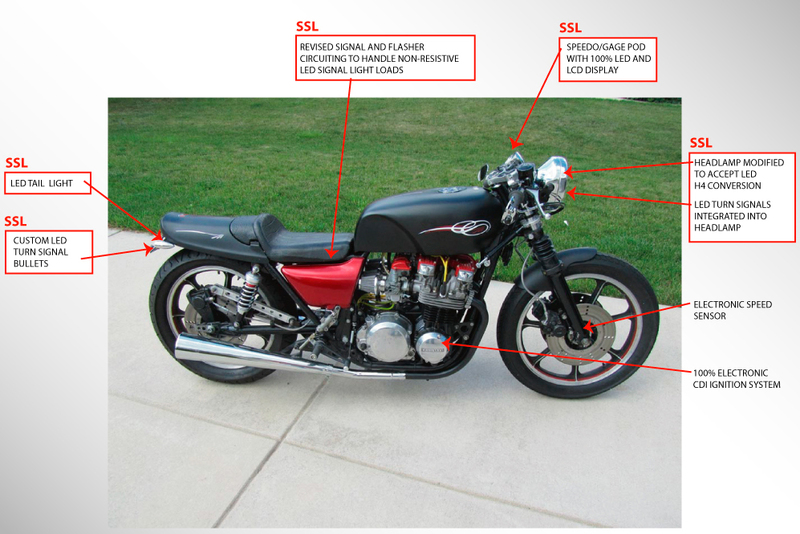 Motorcycles present a few odd wiring flukes that complicate this, so the solution requires a little custom hacking. 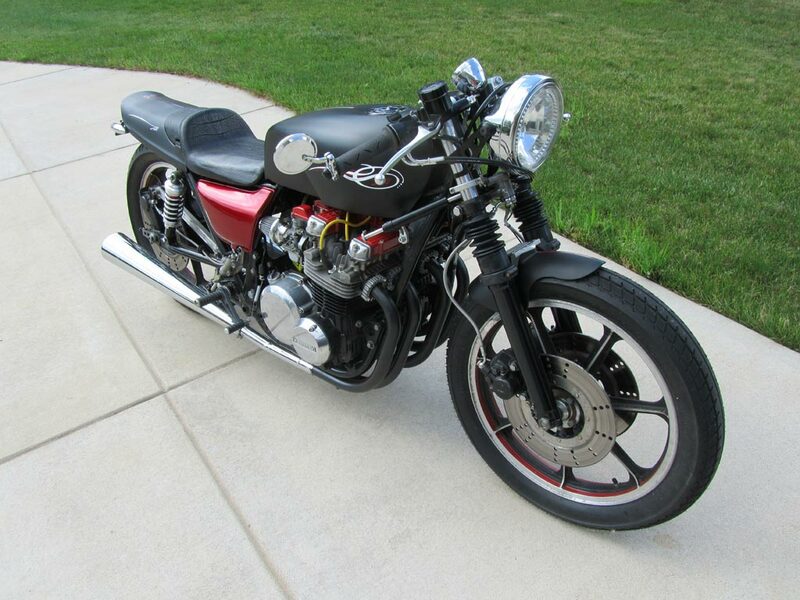 In my case, I was able to find a flasher kit from an on-line electronics kit outlet, that was then modified to work within the bikes wiring system. Problem solved. In the end, the compelling reason for this entire conversion included several desired advantages. Incandescent lamps on vibrating motorcycles is a bad thing, LEDs don’t suffer this malady so no more constantly burned out bulb issues. 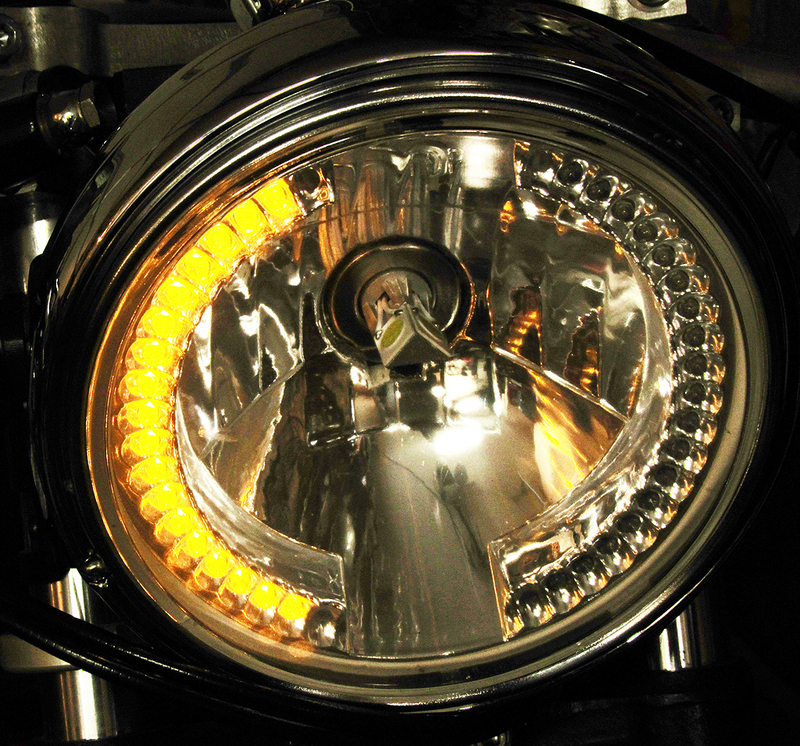 Incandescent lamps present a load to relatively feeble motorcycle power and charging systems. The LED conversion reduced the load on the charging system and battery system from 94W to just 26W total, which allows the charging system to be used by the ignition system, at a more constant output voltage – while delivering brighter lights all around, and decreasing the time it takes to recharge the battery after starting. The LED headlamp conversion also increased the headlamp CCT from 3150K to 6500K, which is more visible during the day to numb-skull cage drivers, and increased visual performance while riding at night. With this conversion, I am now down to just a few CFL and T8 lamps in the shop and garage, and just (2) halogen/filament lamps remaining in my home and work spaces. These will soon be gone as this years 52/52 projects puts them in the cross-hairs. Stay tuned…. My involvement in lighting was born from a graphic arts and photography background, so imagery remains a core interest of mine. 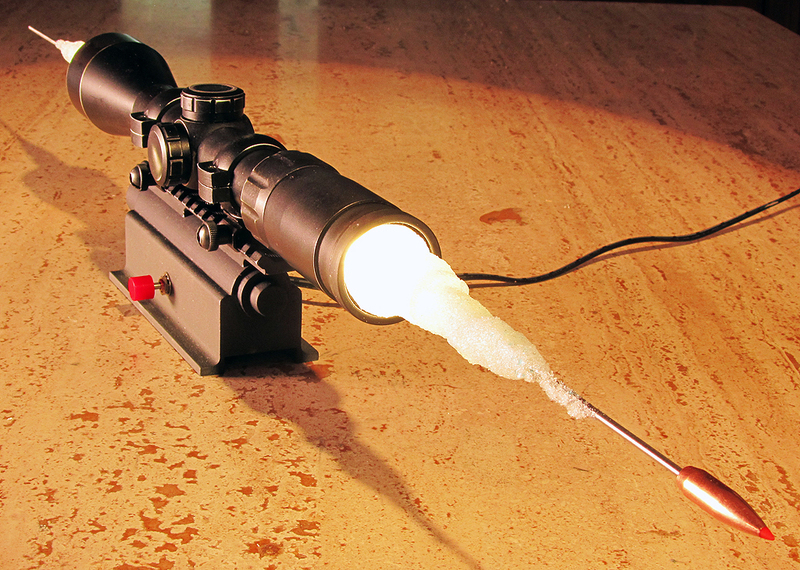 Design 9 was inspired by a particular image of a rifle scope being shot through by another rifle, creating an eruption of glass that caught the light. We’ll get to the reason this was being photographed, and why in a moment. First, what intrigued me was how high speed photography today catches moments in time that are beyond human comprehension. We are blind to most wavelengths of energy, we know that. But, what we seldom recognize is that the slowness of our visual processor is such that we comprehend only a fraction of what is actually happening around us. Time lapse and high speed images catch a fraction more of this missing perception. Time laps images capturing the blooming of flowers, showing that these organisms live in a slow motion universe outside our comprehension. High speed photography shows us the micro-moments that occur while our feeble brains process sampling of bits. Image out-take of the high speed photography caught by the Mythbusters shows the spray of glass from the bullet entering the scope, which inspired me to attempt to create a static object that produced a similar visual impact, representing a successful result. High speed video images of bullets blowing through fruit, and in this case a rifle scope, capture the impact and movement of an object weighing a few grams, traveling at 2000 feet per second, revealing the release of the energy this creates. Now to the specifics. D9 is a conversation piece, meaning it is designed specifically to start or incite a conversation, even an argument. The visual effect I was attempting to capture was This particular image from an episode of the Mythbusters (History Channel property). 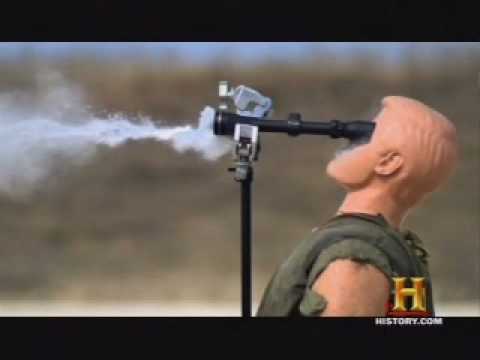 They were testing whether the legend of Carlos Hathcock shooting a sniper through his scope in a legendary incident in Vietnam, was mechanically possible. In this, they placed several scopes some distance down range and shot rifle rounds through them to either deem it plausible or busted. Conversation Note 1: The test was flawed in that it did not test period correct, North Vietnamese optics. First, the optics of that day were not variable, thus were far simpler than the compound optics tested in the episode. I’ve dismantled several scopes over the years, and can confirm that the internals of modern scopes would be impossible to penetrate. 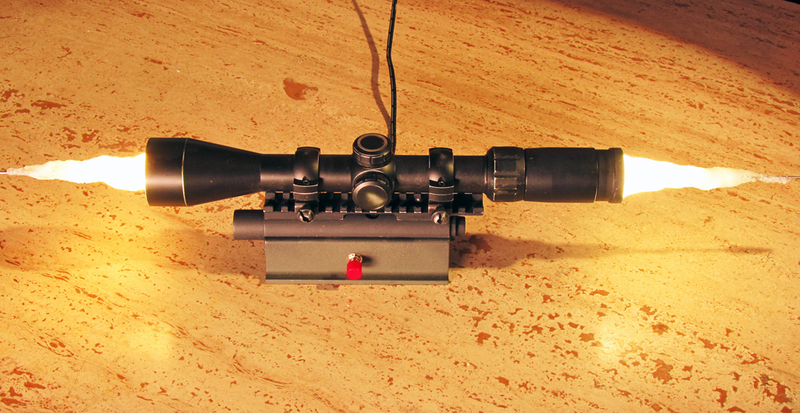 In fact, the scope used in this design took a great deal of effort to “disassemble” with a steel rod and hammer, as the center section (area under the turrets) is very dense in compound lens segments of very small diameter. Fixed, simpler scopes do not include this denseness. Further, the tests did not represent the actual energy of impact accurately, as the distance of the shot was less than 50 yards, let alone 500. The optics of a bullet passing through a scope are compelling, and invisible to us without high speed photography. Optics of Discussion. In thinking about this design, I was captured by the various “optics” involved. The optic of the angles and geometry involved in the shot, the optics of the and within the scope being shot. 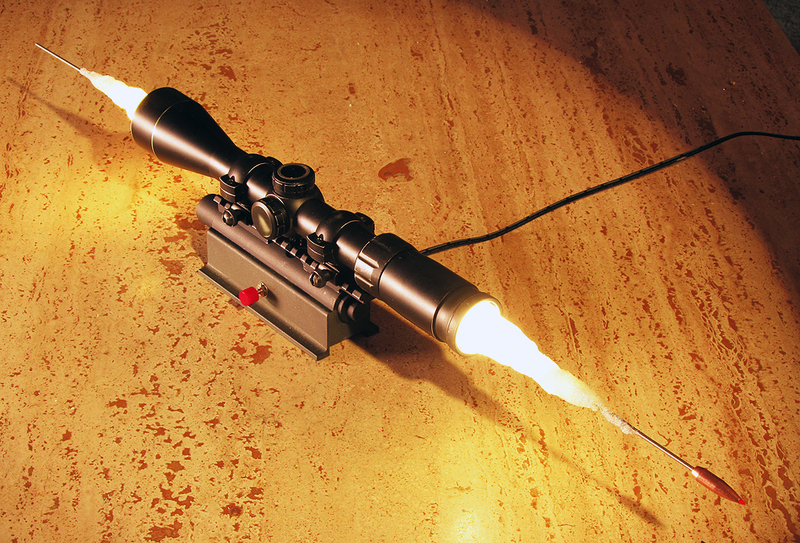 the optics of the shooters scope, the optical challenge of shooting through a tube that is 1″ in diameter, with a thin shell presenting an entry target of 1.5″, from a distance of 500 yards (a little more than a quarter mile), the optic imagery of the bullet passing through the glass, and the unavoidable optic of the repercussions of such an accomplishment. I was also captured by the reaction of the glass, and the release of energy in both the entry and exit directions (shown in tests by others) when the shot is made. Its all very intriguing, which is what makes it such a compelling story / legend. Any deviation from a straight through shot would likely have resulted in less than a straight through result. Conversation Note 2: The scope Hatcock used was an 8 power Unertal and the distance the shot was taken from was 500 yards. The claim is that he saw a glint of light from his target, which he used as a point of aim. The optical field of view of an 8 power scope at 500 yards is around 75 feet. Thst means he was able to recognize and place a target that was 1/600th the field of view, smaller than the width of the cross-hair wires inside the scope of the day. While not impossible, this is on the very extreme edge of it. Conversation Note 3: The glint from the targets scope indicates the sun was behind Hathcock, and that his target was aiming at him directly into the sun. With a field of view of the same 75 feet, he was not only fighting the glare from the sun through optics with marginal clarity, he was seeing Hathcock in the shadows at the same 500 yards? This seems the most unlikely aspect of this story. Conversation Note 4: At 500 yards, for the bullet to travel through the scope tube, the angle would have to be essentially perfectly in line with the scope axis, as any deviation from that angle would result in deflection defeating the the result. That means zero wind drift effect, and zero angle of inclination between the shooter and the target. This seems optically possible, and practically on the verge of impossible. Conversation Note 5: The bullet would need to not only travel the distance of 500 yards but still have enough energy to drive through the scope itself. At that distance, a 175 grain 308 bullet would still be carrying an energy of 1167 ft. lbs of energy, about the same as a 22 LR bullet at point blank range. This seems enough energy to drive through the scope glass. Whether or not there would be enough energy or enough of the bullet itself intact after blasting through the glass is another story. It is possible that the lower energy state is what kept the bullet from exploding when it struck the scope, which renders any tests done with higher energy states for verification totally invalid. That all said, Hathcock was one of the best shooters of the time, decorated many times, and recognized for his contributions. Nothing here is intended to defame that. His credibility is what makes this whole story so intriguing, as he had no reason to fabricate such a story at all. I have seen some truly jaw dropping shots taken by marksman in my own 40+ years of shooting to know that there are people who know how to place shots with precision beyond human comprehension, high speed images or not. The shot is not impossible. The bullet, once loosed, was going to travel through a spot in space down range equal to its physical diameter of .308″. That could have, indeed, been within the diameter of the objective bell opening of a scope. My goal was not to prove or disprove the legend. My goal was to create a static object that presented the visual, or optics, of the composite moments of the bullet traveling the last 24″, and the spray of glass that would have resulted in both directions. The glass spray was created by printing two structures on the SLA machine in transparent material, then coating those with clear urethane, which was then dusted with shattered glass. Internal to the scope are 2 LEDs aimed outward. 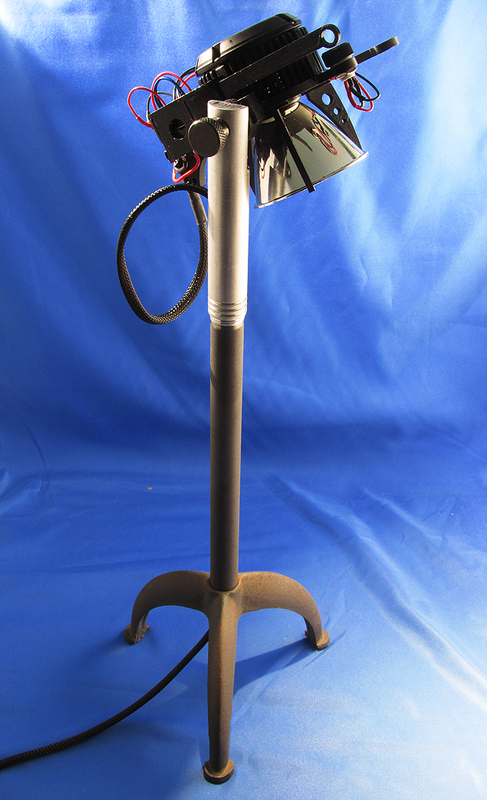 The top turret cover is a dimmer knob, while the section of rifle below, printed on the FDA machine (sanded and painted) houses the driver and a military style on-off push-button switch to cap the whole design aesthetic. As demonstrated in D1 of this series, LEDs and solid-state technology are changing more than general illumination. Other instances of applying near UV LEDs with emission to cure light-cure resin composites. We have applied this to replace Metal Halide light sources that require 20 minutes to start-up, and are skin frying monsters. LED cure lights are also more predictable and focus-able than natural light, and can be applied indoors, and less bulky and more powerful than fragile fluorescent cure systems. 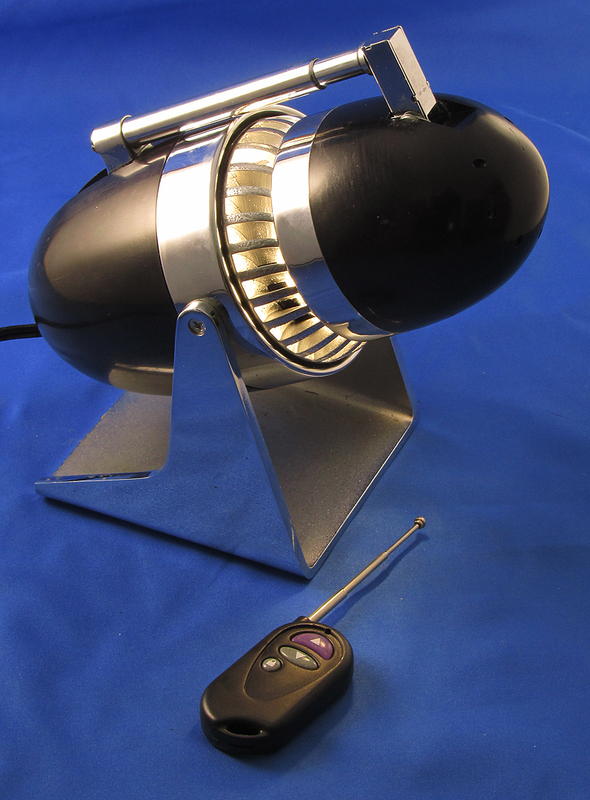 LED sourced cure lights are now used in printing, dentistry, and commercial production of resin-based composites. We are also applying this on small and large scale applications from the very small (like D1 SLA curing) to larger scale units for curing large objects, like fiberglass repair of boat hulls, custom automotive body panels, and low odor repair of fiberglass bathtubs and shower floors. The use of LEDs produces instant-on high intense light, with much less power, significantly less heat in the lighted pattern, less exposure to hot surfaces, and contain none of the damaging ultraviolet light that does nothing to enhance curing, but is harmful for operators. The use of UV initiated resins offer the advantage of extended shelf life as there is no catalyzed resin to harden in the container and less odor for use indoors. An update with new images and details will be posted here when available. 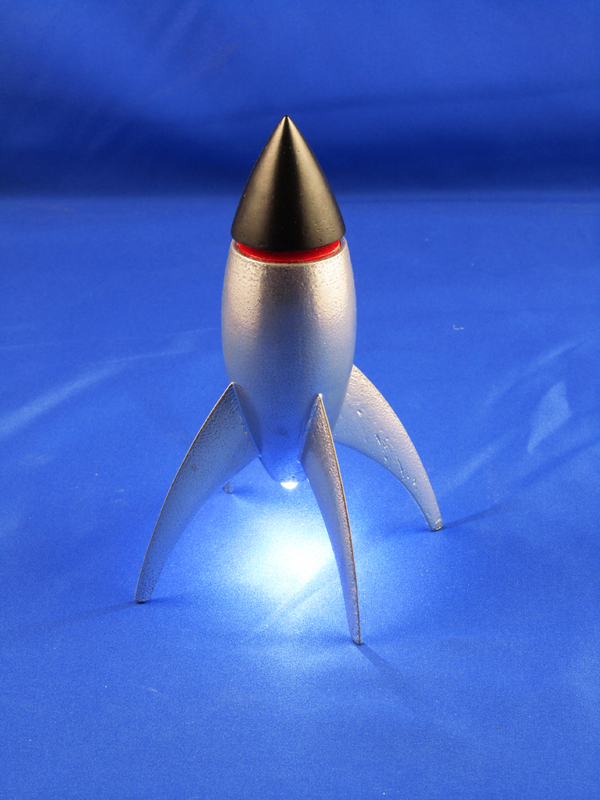 This little rocket will light the way through the darkness from a bedside table, no cords attached. Being active in the evolution of emerging new and exciting technologies is rewarding and fun. Being involved in two at once is even better. The blending of 3D printing to produce functional and prototype parts, not to mention just making things we need around the house, has shown me that as this technology expands and improves in both cost and performance, it will eventually change how many things are made and brought to market. In almost every community, there are others that share this view, who meet to share their ideas, show off machines or products, and seek input for completing their own pursuits. Like it has been with the solid-state lighting universe, I am asked to present at these gatherings. The range of topics include exploring the practical aspects and economies of 3D printing, to specific examples of making a product combining LED sources into a 3D printed end-product. Design 7 is a product I made up to demonstrate the process of bringing a design idea and functional end-use together in a form that could be made in a few hours, from design to finished product, using a desktop 3D printer and less than $10.00 in parts. In this specific case, the idea was for a small bedside table night-light in a form that was as fun when it was not in use, as it was when lighted up. 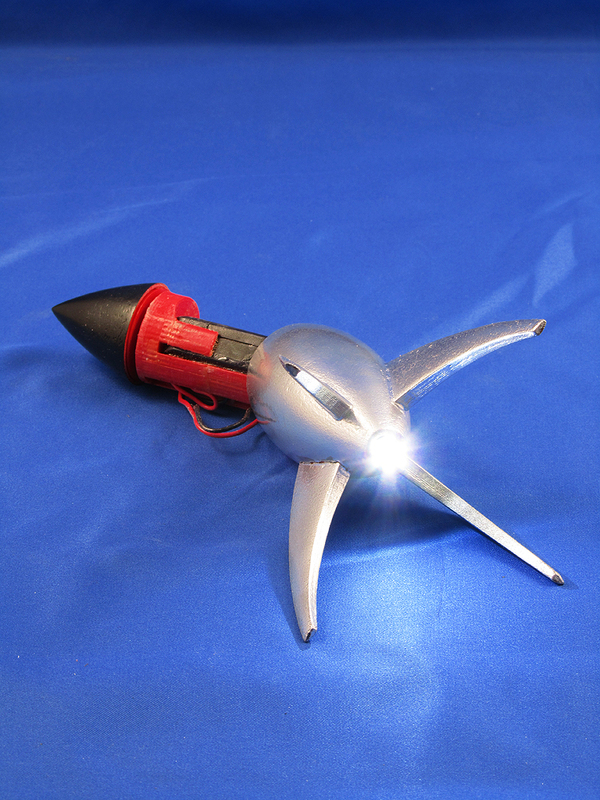 Pressing the rocket nose cone starts the LED light “engine” creating a glow that works as a security or path light in a dark room, while when off, looks the part of a vintage rocket toy. For the purposes of the demonstration, I printed the model a couple of times to show different techniques, from printing in one pass using two colors of material (with inferior structural strength), to breaking the model apart to print the various components for optimized strength. The final model was then sanded and painted to create the finished effect. 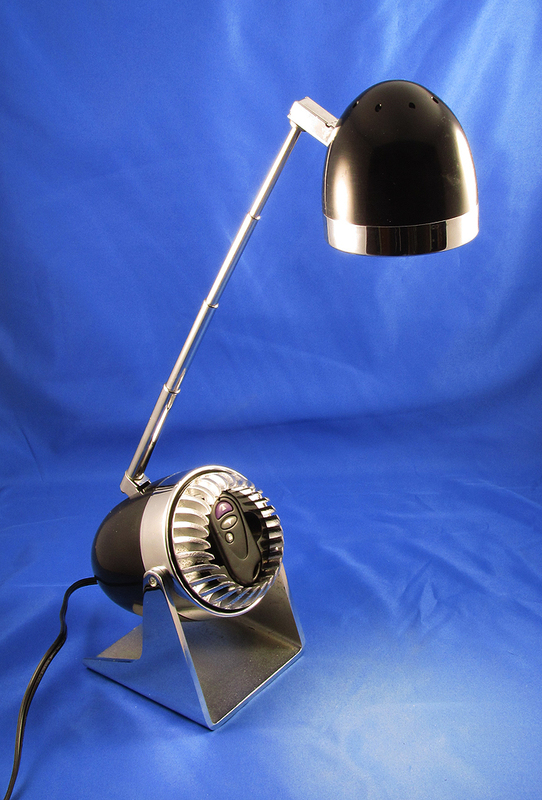 The internal LED components came from a reading lamp purchased at a bookstore for less that $9.00, which was then dismantled for its LED, control, and battery holder. 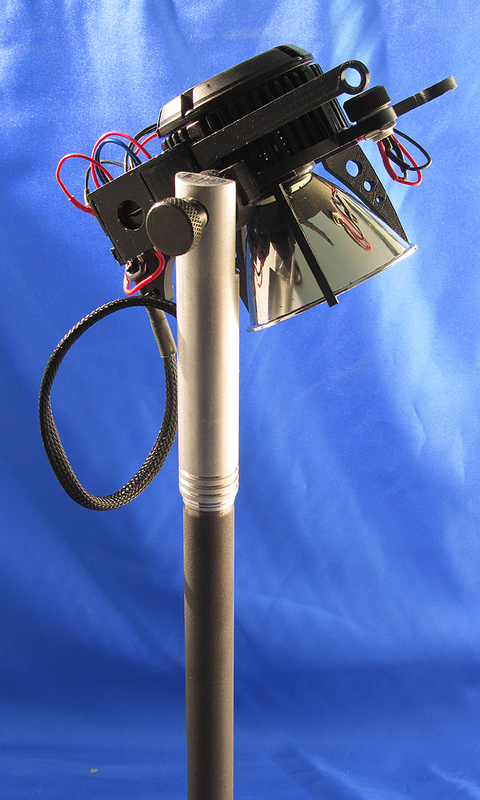 The LED was mounted into the rockets body, while the internals were incorporated into a removable internal sleeve to facilitate battery changes. 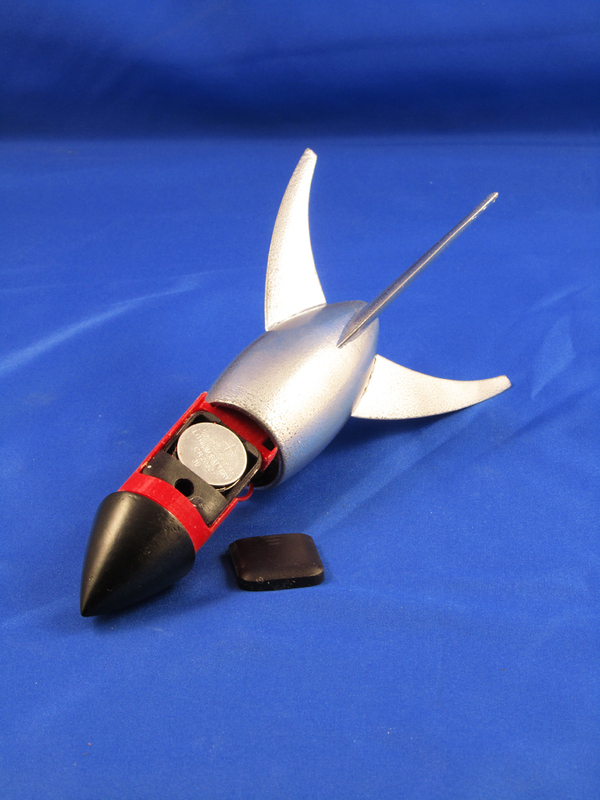 In all, the total cost involved was around $18.00, including 3D plastic, and around 4 hours of work, after the design/model was created in SolidWorks. 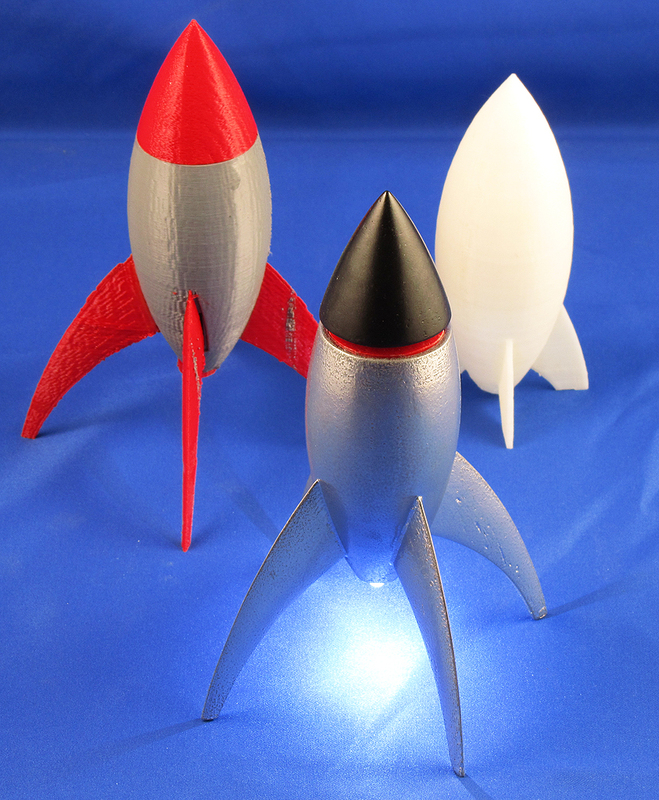 While the demonstration was successful, and well received, it did point out the one weakness in the entire 3D printing universe – the connection with 3D modeling software, and expertise in 3D design required to create novel end products from scratch. This, combined with the rather rudimentary and frequently poorly developed 3D printer software, is a greater roadblock to expansion of this technology than the actual printing hardware is at this time. I found this little light on ebay at a lunch money price, so couldn’t resist. 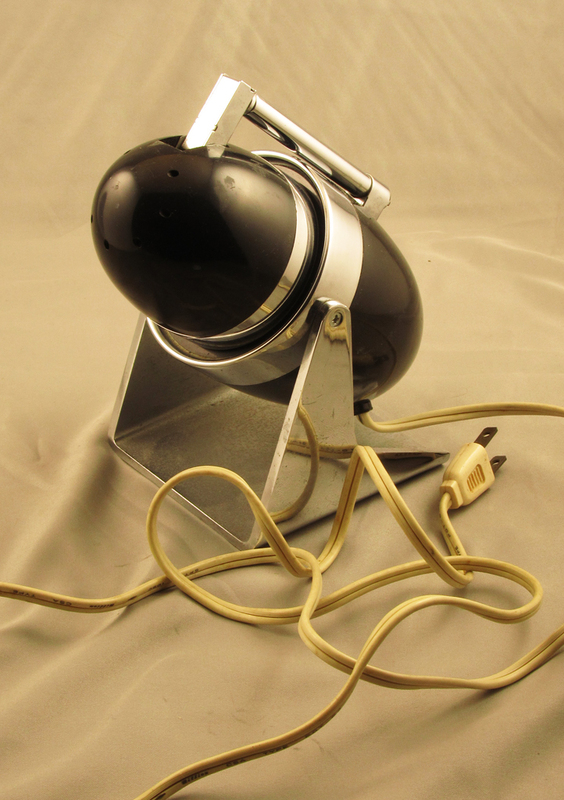 It started life as a Hamilton Industries (Chicago) lamp model 60, made in Japan in the early 1960’s. 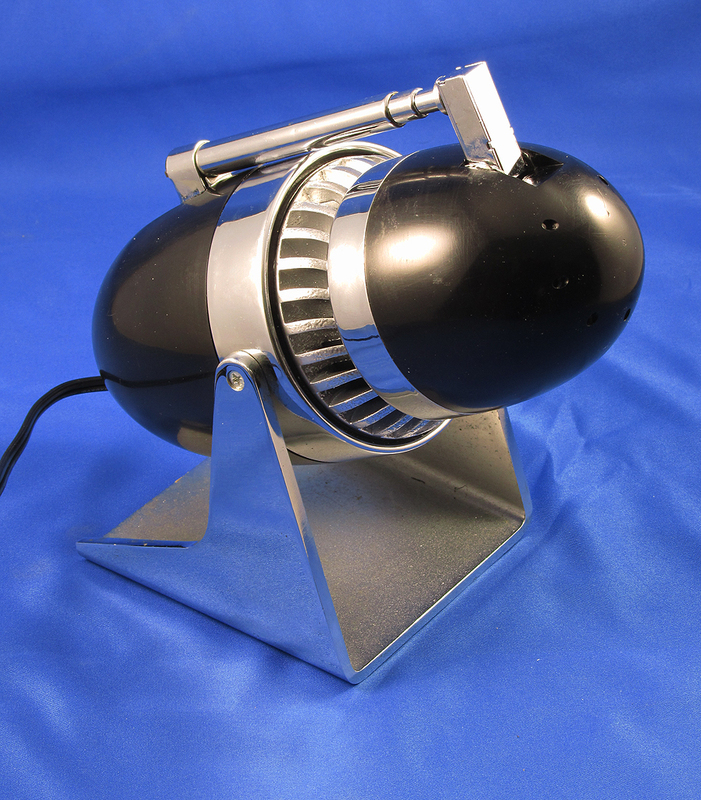 It used a 12V magnetic transformer and a resister to provide a dual level light control of its 20W signal lamp. The amount of light it put out was barely visible in the presence of any ambient light. Meanwhile, I had a cute little key-chain wireless remote controller for less than $14 from LED Supply that delivers PWM dimming and on-off control of 12VDC LED loads. I stripped the guts out of their kit and put them inside the base of the fixture. 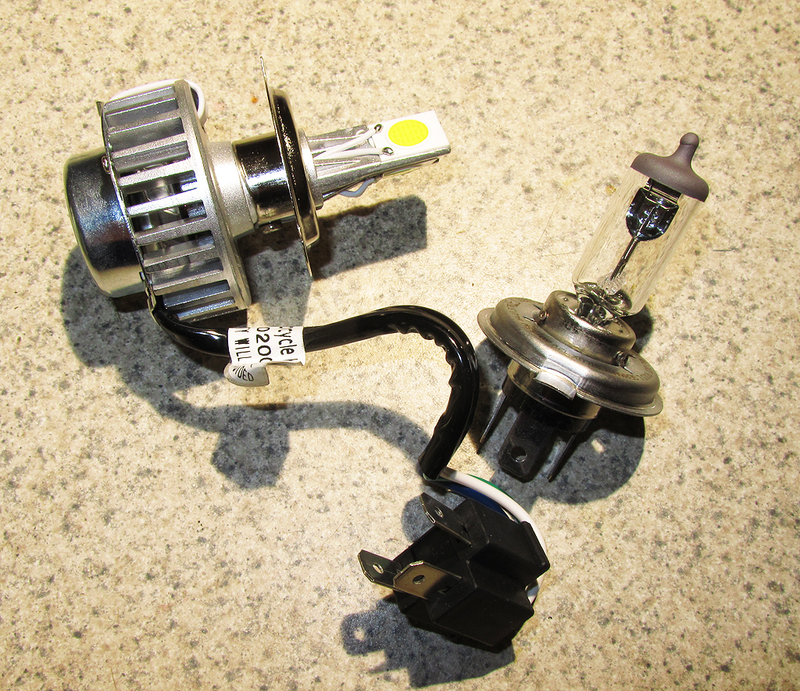 The little lighting head was about the right size for a 12V MR16 lamp, so rather than re-invent that wheel, I just retrofitted the head to take a bi-pin socket and planned to use a retrofit MR16 lamp to deliver the light I wanted. That ended up more of an issue than I expected. First, after testing of all the LED MR’s I had around, only one brand would operate and dim effectively when run on DC power. The rest were poor dimming on AC power, but on DC they were miserable. On the LED Supply remote dimming module, they were useless. 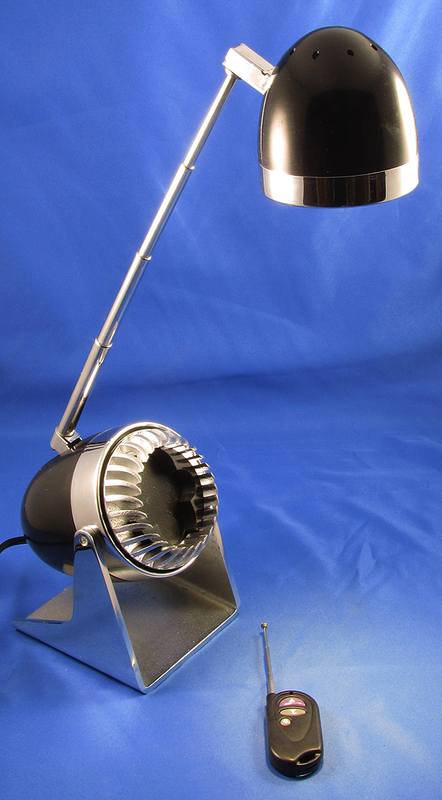 The lamp I ended up with was a Philips Enduraled product, and it will dim down to around 10%. The remote control acts as a panel control when nested in the base, and as a remote control with cute antenna when separated. The remote control is a bit of fun, as it has an antenna that works well with the antenna arm on the fixture, so they seemed a great match. I printed a holder for the face of the power supply (now control) enclosure at the base of the fixture to hold the remote, which makes it a simple panel controller when the remote feature is not needed. When the light is used to wash a wall or light art or some other function besides a desk lamp, the remote can be removed and control the fixture from across the room. The power supply is a simple 12VDC wall wart, while the base houses only the remote control electronics now. The base now incorporates the remote in a recessed compartment. The base looked in need of a bit of dressing up, so I printed a retro-turbo trim ring to surround the remote control mount on the SLA printer and painted it with VHT fake chrome to give it a sand-cast aluminum look. 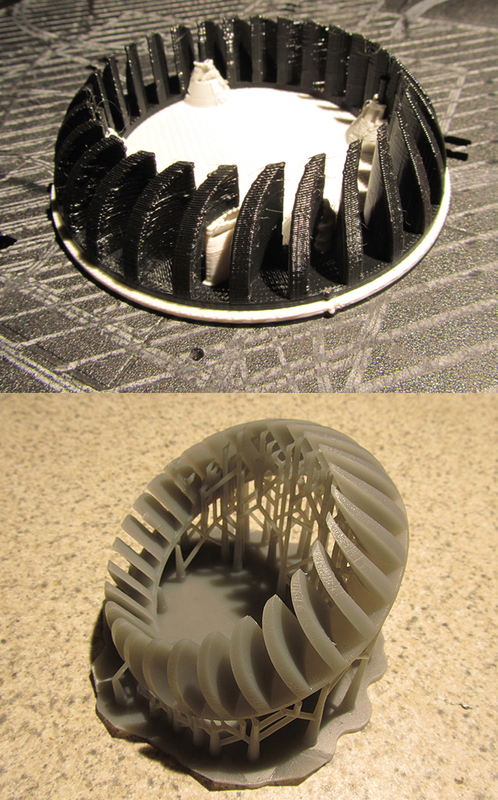 I also printed the same part on the FDM printer for comparison. I’m throwing in two images of the raw prints to show the difference in surface quality one gets between these machines. Obviously, for parts that include details that will be hard to sand and fill, the SLA process is superior. For parts that need to be strong and can be easily finished, the FDM is the go-to tool. So, this little weak black egg ebay find has been transformed from a barely functional desk lamp novelty, to a bright, useful, remote controllable, dimmable, black egg turbo trimmed LED light novelty. I’m a fan of the 50’s and 60’s design aesthetic, so this one felt right and was fun to put together. While FDM 3D printed parts (top_ are strong and easily finished, in fineer detail work, they lack fidelity and smoothness. The SLA (bottom) part is much smoother, requiring less finish work, but are less durable. In this case, the FDM is printed at its finest setting, the SLA at its coursest, so the contrast here is greater when the SLA is pressed to maximize reolution. Both took 2.5 hours to print. Overall height is 19″. The base is a salvage item from Goodwill. I am a task lighting fanatic. I use them everywhere, so am always looking for something new to add to my collection. In this installment, I am addressing the need for a light that is compact, delivers intense light (1,200+ Fc) with no glare or brightness, and high color accuracy. The application is pretty straightforward, from soldering station use where a magnifying glass is used, to fine detail work inside or on the outside of models. For good measure, I also wanted it to aim at the wall as a photo fill light, or straight up as am ambient fill light, and have a dimmer to allow me to set whatever level I want for the application in hand at the moment. The wiring and components are left skeletal. With all the practical specifications set out, I decided to let this design be expressive of the gadgetry involved. Let it all hang out. I also decided to incorporate the new Bridgelux Vero LED with its integrated Molex connector, and a Nuventix cooler, just to amp up the tech factor. This is where things got interesting. The Bridgelux array operates at 33.7V (500mA). The Nuventix cooler at 12V. I am powering the whole thing with a 24VDC wall wart power supply. That meant I needed to employ a boost driver for the LED and a buck (24VDC to 12VDC) power converter for the Nuventix cooler. I used Recom components to attain this, and used a cut up experimenters printed circuit board to connect these two to the power supply, the cooler, the LED and the dimmer control. That’s a lot of wires to find a path for, so I decided to leave them to roam free, let everyone see the components as well. 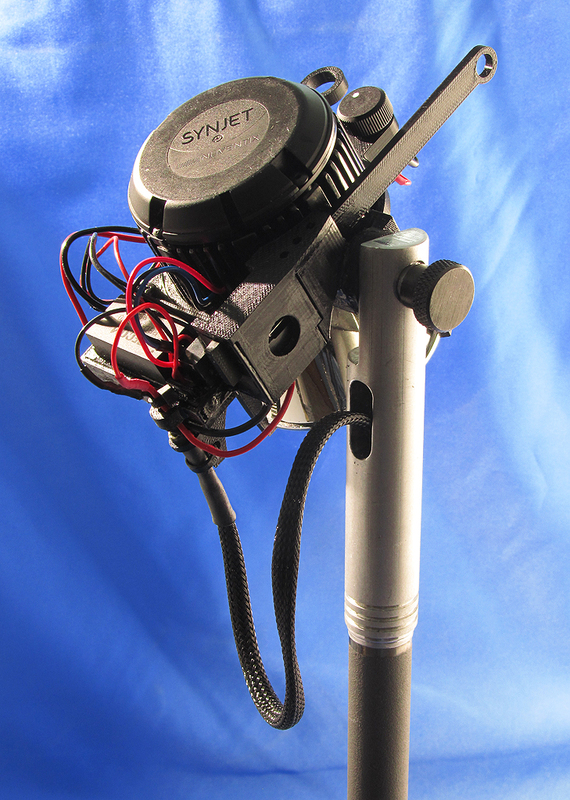 The lever on the left of the head is the on-off slide switch. This is a style of design I personally enjoy, and have been doing since the 1980’s, where we made little 12V lamps with fiber optics, MR16s, halogen burners, or automotive headlamps, often suspended from structures made of building wire. In this case, the stand I found at a Goodwill. It was a table lamp, whose shade was gone, and socket was cracked. I liked the cast iron base and single post stand, so nabbed it for a dollar and tossed it in the pile with my other finds, waiting this moment to be put to service. The wiring at the driver and power supply are exposed as well as the mess of wires leading into and out. If you look at the head, the switch is a sliding action, on the left side of the head. Pull it forward to turn it on, push it back to shut it off. A hole in the side of the housing allows you to see the action inside. No, there is no reason for this, other than it seemed more appropriate than an off-shelf toggle or twist switch. The light on the task surface is at 1,425 Fc, the LED is 3000K, 97CRI. The head can pivot 180 degrees from down to straight up.